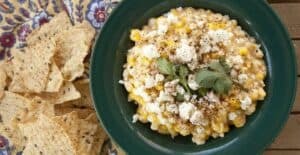 This recipe is my take on the corn dip appetizer at Elote cafe in Sedona, AZ, that is based on the flavors of South American street corn, YUM! 1) Preheat oven to 500 degrees Fahrenheit. Lay out corn on a baking sheet and bake for 15 minutes, turning once, until corn is well charred. You can also grill the corn over medium heat. 2) Let corn cool briefly and then shuck. Cut corn kernels off the cob. I find it helpful to cut kernels off in a bowl so the kernels don’t scatter all over. 3) In a separate bowl, whisk together mayo, lime, hot sauce, salt, pepper, sugar and stock. 4) Add sauce to a large skillet over medium heat. Cook for a few minutes until it starts to bubble. 5) STir in corn and cook for 2-3 minutes until the mixture thickens and the corn is heated through. 6) Transfer corn to a serving bowl (or split between a few) and garnish with crumbled cheese, cilantro, and chili powder. Serve with chips! Adapted from a Food.com recipe. This delicious recipe was brought to you by Macheesmo. Read the full post at https://wp.me/pkSYO-9nf.